Dear Reader, I am new to blogging, and have now learned that there are such things as blog awards. How do I know this? I just got one! My sweet blogger friend Tanusree Roy (find her here) nominated me for one. No, two! 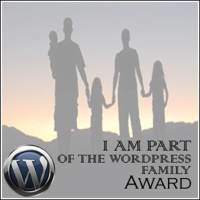 the WordPress Family award and the Liebster award. How sweet. She has a lovely blog with wholesome recipes that nourish you inside. I don’t mean nourish you just in your stomach and intestines, how gross. I mean way, way inside. Deep inside. Thank you Tanusree. Anyway, one part of the award is that I get to show off these medallions on my blog. I don’t think that is a particularly web-savvy term (medallion? What are we, Romans?) but I can’t think of a better word. Greedy, envious, lazy. I’m never wrathful though. I’ll name several. Nature science, any science, gardening, reading Victorian novels. Old Hindi songs. Hating on sports. Knitting. Politics. I also like deep saturated colors. Electric blue. I like it. Some place that has good food. Rome, Nepal, and definitely the English countryside. What would you bring to a potluck? In fact I recently did go to a potluck and brought this: King Julienne, which I made up for the potluck out of whatever scraps I had in the fridge. I remember trying to hypnotize my cousins and succeeding in making them fall asleep. I remember trying to call spirits with an ouija board at school. I remember visiting a foggy place for vacation and trying to bring back some fog in an empty suitcase. I remember looking forward to going to Taj hotel with my parents just to go up and down in the elevator. I remember how exciting it was when my brother was born. I remember falling down a slide and chipping my two front teeth, which were brand new at the time. I remember my grandfather telling me that crows ate his hair (he was bald). I am five feet tall and love insects but hate cockroaches. I am a Scorpio but don’t think much about astrology. I met my husband because of his love of Raj Kapoor and he could tell I was Indian. If this was your last day to live, how would you like to spend your day? Probably on the phone with medical doctors trying to figure out what the heck to do. Oh — and I would desperately try to impart recipes to my husband and daughter so that they know how to fend for themselves. Well, I guess they could just read this blog. It will keep going for a few months at least even without me around to renew it on WordPress. So forget it, doctors win. This is the fun part. There are so many wonderful blogs out there, with such interesting things to say, that I feel lucky. Thank you Internet and the bloggers therein. I will leave comments at their sites and hope that they accept it. I guess ‘accepting’ the award means they answer these questions and nominate 5 more blogs, like a chain letter. So — I’m sorry and thank you for your wonderful blogs! Aneela, I don’t think I’ve enjoyed and chuckled more when reading an award post than yours! Ha ha. But wait, the English countryside has good food? That was great! 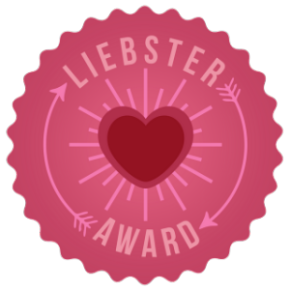 Even if it is a chain letter style of award it is fun and gives us readers more perspective on the blogger(s) we *think* we know. I especially loved reading your childhood memories–in particular trying to bring fog back in your suitcase! And now you get to see fog all the time in San Francisco–childhood dreams come true! Have an electric blue Friday! Yes I think of how fascinating it was to see the fog all those years ago when it was so unfamiliar (and by the way I called it a ‘cloud’, which is what it is). Swirling fog in the West of Twin Peaks area has not lost its fascination for me still. PS: I think the official webbie term for the award graphics is “badges”–but I like “medallions” and the association with the Roman Empire.